The Warcraft universe contains a number of loosely related races on the side of the good, humans, dwarfs and elves and on the evil side orcs of one sort or another and some lesser races only seen imprisoned in cages in semi-darkness. Both sides have people capable of invoking magic spells and if evil their eyes glow green, if good their eyes glow blue. The orc planet is being destructed so their leader creates a portal to Azeroth, the realm of the humans etc, allowing a party of orcs to transfer to it to battle with the humans. The evil leader wishes to create a more effective portal to allow the whole orc race to transfer. Can he succeed? Scenes in the human castles where the warriors are constantly dressed in heavy armour, or the orc side where the orcs are festooned in decorative bones and carrying fearsome weapons, the wizards make spells involving sort of blue light, the human commander has a romantic interest in a half orc slave, conveniently similar to a human woman except for being greenish. Battles take place mostly without any definitive conclusion, the portal comes and goes. There is a final conflict which results in… (I did write what it resulted in but you’d have to have some reason for watching). A View I found myself pretty confused by the narrative and afterwards read the Wikipedia description of the plot but it did not help much. The critics who did not like it, and there were many, mainly cited the lack of character development, and the fact that there were many of them, as the main failures. Maybe you had to be a fan of the game to appreciate it, so I had a look at the game’s website which also seems to be very complicated, so possibly the scriptwriters did their best with an environment where you make up the plot yourself. 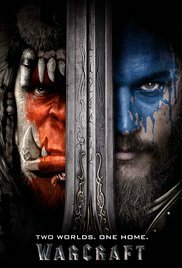 Unless you are a Warcraft fan, maybe give it a miss. Additional Info Despite the fact that this outing made more money than any previous outing based on a video game, it has been said to have still lost money, and even though it was obviously part one, there has not been a part two.